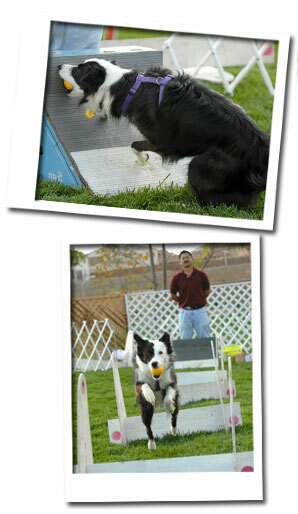 Flyball is a relay race for dogs. Two 4 dog teams compete against each other for the best time. The 51 ft. raceway consists of a start line, a 6ft. space, 4 jumps spaced 10 ft. apart, and a spring loaded box (machine) which is located 15 ft. after the last jump. Drag strip style lights initiate the race, as the first dog crosses the start line. As soon as the dog finishes the four jumps, it triggers the box, catches the ball, and returns over the four jumps. As it crosses the finish line, the second dog is released. The first team to have all 4 dogs successfully complete the raceway wins the heat. Errors such as dropping the ball, missing a jump, or passing early will require the dog to re-run. Jump heights are gauged by the height of the smallest dog on the team. Jumps range in height from 6 inches to 16 inches, depending on the “height dog”. Competing teams race iin specific divisions against teams with similar times. These races or tournaments” as they are called, are held outdoors on grass or indoors on mats. Tournament are usually 2 day events held on weekends.